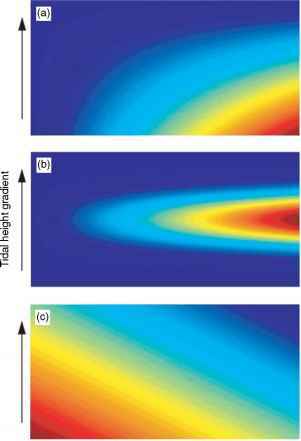 Figure 6 Hypothetical variation in (a) mussel recruitment rates, (b) mussel growth rates, and (c) predation rates in a two-dimensional landscape of tidal emersion and wave energy. Spectrum from blue to red represents relative difference in rates, from low to high, respectively. Adapted from Robles CD and Desharnais R (2002) History and current development of a paradigm of predation in rocky intertidal communities. Ecology 83: 1521-1536. Figure 7 Simulated zonation of a mussel bed in gradients of tidal emersion (y-axis) and wave energy (x-axis). The color spectrum from light blue to red represents the presence of small to large mussels, respectively. Dark blue represents no mussels present. Adapted from Robles CD and Desharnais R (2002) History and current development of a paradigm of predation in rocky intertidal communities. Ecology 83: 1521-1536.
configuration of the mussels. Relative to solitary individuals, clusters of large mussels incur more settlement underneath them, and they increase the survival of the newly settlement mussels by shielding them from the predators. The resulting positive feedback on the establishment ofmussels in aggregations is strongest at lower shores levels, causing the lower boundary to intensify and descend to a lower shore level than would occur without this effect of spatial configuration. The predicted alongshore trends in both the shore levels and intensities of boundaries match patterns observed in the field. The common dynamics of the diverse synthetic models is that a complex of physical factors varying over environmental gradients constrains size-dependent interactions. A shift in the relative intensity of the interacting factors over the vertical gradient, rather than direct effects of a single factor, shapes patterns of zonation. 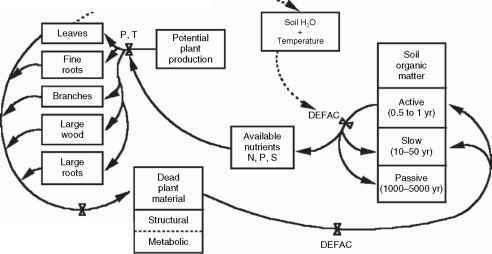 nutrient exchange is greater in the latter conditions (Figure 6b). Risk of predation, principally by Pisaster ochra-ceus, increases over the gradients toward longer immersion, due to longer Pisaster foraging periods, and toward lower wave exposures, due to less hydrodynamic stress on Pisaster foraging (Figure 6c).